Complete a traffic study and signal warrant analysis to add capacity and improve safety at the intersection of US 25 (Dixie Highway) and KY 2847 (Empire Drive). The study should consider both traffic volumes and crash patterns to determine the need for an improved intersection configuration and/or new traffic signal. Implement the recommendations from the study. 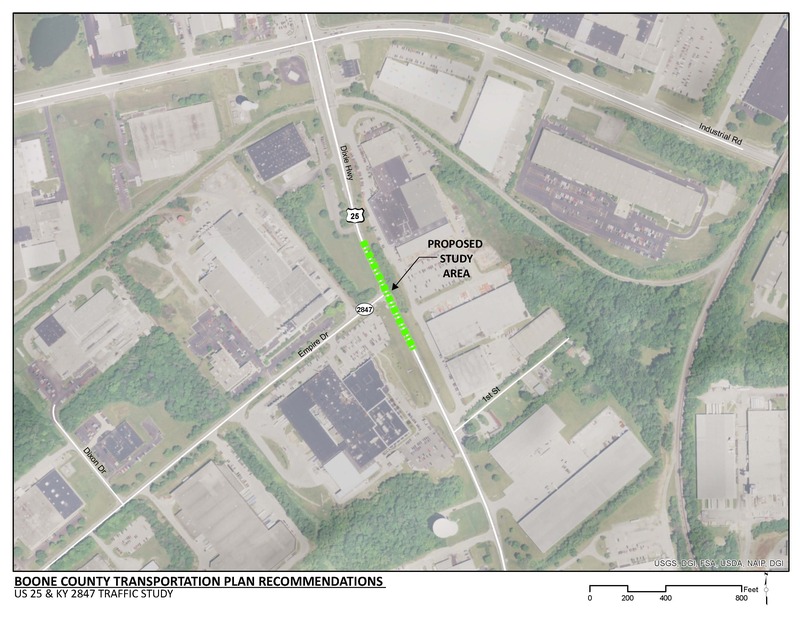 This project will improve capacity and safety at the intersection of US 25 and KY 2847. There is limited right-of-way Along US 25 and KY 2847. This project will require acquisition of additional right-of-way. Overhead utilities run along the east side of US 25. If turn lanes are warranted on US 25, consider widening to the west of the corridor to reduce construction costs. KY 2847 and US 25 serve several industrial industries along the corridor. Many employees that work at these facilities rely on TANK services for transportation to and from work. Several of the responses from the TANK driver surveys indicated safety and congestions concerns when turning left onto US 25 from KY 2847. At this intersection, drivers indicated that they are waiting too long to pull onto US 25, because there are not sufficient gaps in traffic to complete this movement. As a result, drivers are accepting a reduced gap in traffic, and increasing the likelihood of a crash at the intersection. There is a TANK shelter located in the south-west quadrant of the intersection. There is a recommendation to install sidewalks along Empire Drive. This project should coordinate improvements with this project.